Work started on the Connected Counties programme which is being managed by Bucks Business First in Autumn 2013, and this month the 150th green roadside cabinet went live, making fibre broadband connections available to order for an additional 35,282 Buckinghamshire residents and businesses as part of the £18.06 million project. The 75% milestone comes as the Government’s superfast broadband programme announced its three millionth connection today. BTVLEP Chief Executive Richard Harrington welcomed the news but said there was more work to do to ensure superfast broadband coverage is available to all. 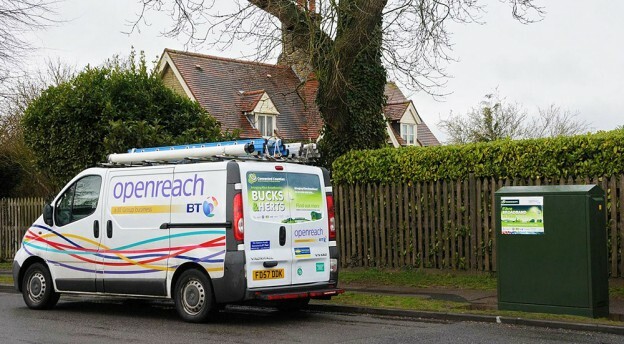 “Many of our Buckinghamshire businesses are in rural communities that had limited high speed fibre broadband until now,” said Richard “Whilst this is good news for businesses and residents who might otherwise have been stuck in a digital backwater, we must keep the fibre cables rolling out”. The latest census figures showed that the Buckinghamshire LEP area had second highest proportion of homeworkers in the country with 16.5% of people regularly working from home. Technological advances and lifestyle changes in recent years mean that this figure continues to rise . Buckinghamshire Thames Valley Local Enterprise Partnership (LEP) and Buckinghamshire County Council gave £3.7m to support the installation of high speed broadband in areas of the county that commercial operators aren’t serving, through a consortium of LEPs, BT and Herts County Council. The deal, signed with BT in June 2013, aimed to achieve 90% coverage – around 45,000 homes and businesses in more than 200 locations – with broadband speeds of up to 80 Mbs (megabits per second). A second phase of the programme which aims to take coverage in the county beyond 95% by 2017 has recently been approved by the BTVLEP Board who along with the district authorities in Aylesbury Vale, Wycombe and Chiltern are investing a further £2million and unlocking a further £2m Government digital investment for Buckinghamshire. The latest areas in Buckinghamshire to be connected under the project included neighbourhoods in Aylesbury’s Gatehouse area, Marlow, Wrexham, and Lillingstone Dayrell. In the next few months, new high speed fibre broadband roadside cabinets are scheduled to go live in Burnham, Winslow, and Eaton Bray. Culture Secretary John Whittingdale said “Reaching three million properties is a huge achievement. Our rollout of superfast broadband is transforming lives up and down the country as every day thousands more homes and businesses are gaining access to superfast speeds. The levels of people taking up superfast broadband in areas where we invested public money are beyond our expectations, and BT is now reimbursing the public purse to deliver further coverage across the UK. This now means that BT will be providing up to £129m cashback for some of the most hard to reach areas”. Dave Hughes, BT’s regional director for the East of England, said: “Today marks important milestones, both locally and nationally, for the superfast broadband revolution. This exciting technology is transforming the opportunities for communities across Buckinghamshire and the UK as a whole.